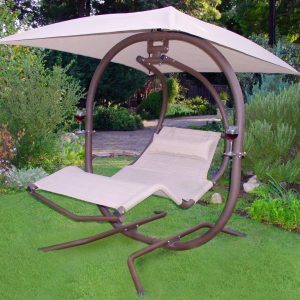 This gorgeous and unique outdoor glider swing is for that special someone who has everything and truly demands only the best. Unlike the stiffly bolted hinges of most swings, this model glides gently on 2″ precision sealed, whisper-quiet, steel ball bearings that ensure smooth and uniform movement. Comfortable for four (or even 6 adults! 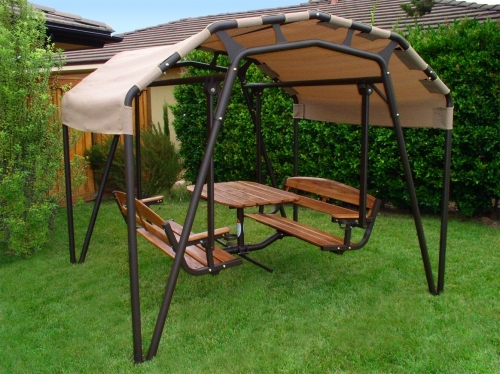 ), the unmatched quality of this amazing glider swing will provide years (decades!) of joy!! 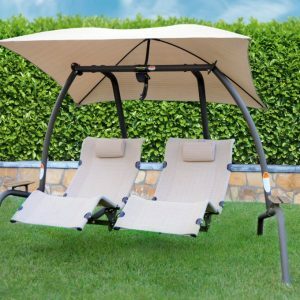 The included canopy is durable, UV resistant fabric and covers a full 9′ x 9′. The seats arms and tables are teak wood, and the pendulum frame is 2 1/2″ diameter heavy-duty 11-gauge tubular steel electrostatically coated in a resin powder finish that resists chips and scratches. All frame bolts are a hefty 1/2″ and are treated with anti-rust sealant. Attached drink holders are included. Frame: Heavy-duty 2" round 11 gauge tubular steel. Powder Coated Finish: The Polyester Electrostatic Resin Powder. Coat offers a durable, low maintenance finish. Parts: Hardware consists of 1/2" and 3/8“ anti-rust coated bolts. The pivot points have 2" precision sealed steel bearings, to ensure a smooth and relaxing motion with no maintenance. Seats and Tables: The seats and table are constructed of teak wood. The teak wood seats and table offer seating for six and room for multiple place settings. Footrest: The folding footrests offer foot support for up to six people and tuck under the table when not in use. 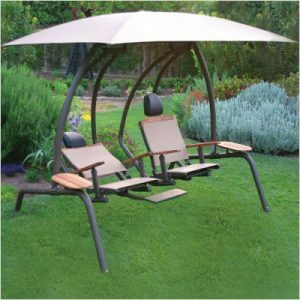 Canopy: The canopy is constructed of Vinyl Coated Polyester fabric that is stain resistant and UV protected. Warranty (Residential use only): Sunset Swings have a 10-year limited warranty. Dimensions: Width 92" x Depth 101" x Height 86".